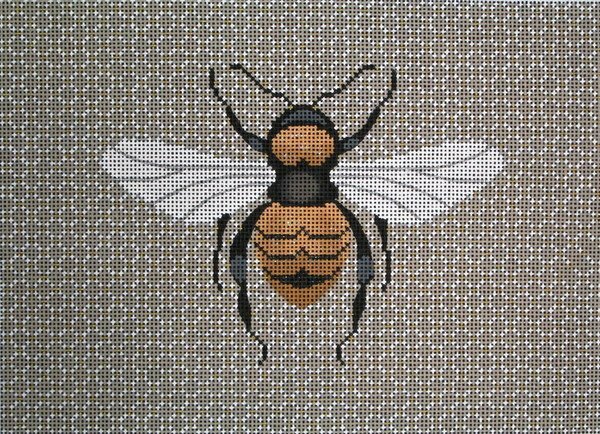 This bee needlepoint design is skillfully handpainted onto 13 mesh mono Zweigert needlepoint canvas. The design area measures 11" x 8". You can purchase this design canvas-only or with fibers. If you select cotton we will send DMC embroidery floss + a spool of Kreinik Gold Metallic; if you select wool or silk we will send Planet Earth boutique fibers specially formulated for 13 mesh canvas, plus the appropriate kreinik metallic thread. This design is suitable for an intermediate stitcher. If you wish to purchase stretcher bars we recommend a pair of 15" and a pair of 12" stretcher bars. Please contact us if you have any questions. We are always glad to help.